I’m getting excited. My wife and I are travelling to Hawaii for the holiday season and I can’t wait to get there and enjoy the beach. The time is coming soon. I’m looking forward to also checking out some of the breweries there that have popped up since the last time I’ve visited. Saying all this, I won’t be posting much other than this calendar and one other write-up I have scheduled to be posted. So, no Friday Beer News until the new year. But, we still have a few more days of this Calendar left, so let’s get to it. 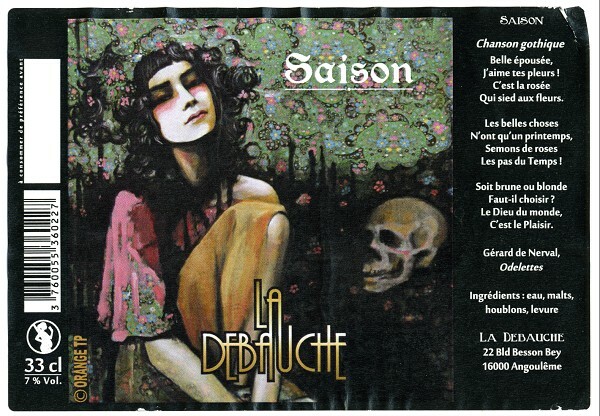 Today we have a beer coming to us from La Debauche Brewery located in Angoulême, France. The beer is a Saison. The brewery was founded in 2013 by a couple of beer lovers and amateur brewers. Wanting to bring their beers and a love for the craft to the people in their region, they decided to make a go professionally. They are one of the new development of breweries that seem to be popping up in France. The brewery is located close to the town centre to reintroduce the brewing industry to the urban environment. They produce a wide range of beers ranging from an Imperial Stout aged in Bourbon to a Saison, to the amber we are trying aged in Cognac Barrels. What’s even more interesting about their beers is that they partner with local artists and tattooists to develop designs for their labels. This creates some neat artwork and makes for a unique experience when drinking their beer. At one point in time Saison’s were an almost extinct beer style but they have seen a great resurgence and are commonly brewed by several craft breweries across Canada. Saisons, for me, are an interesting and flavourful style of beer that can bring a lot of interesting notes. I’m excited to give it a try. Appearance – Pours a cloudy blonde colour with a thick white head. Smell – Yeast esters bringing some yeasty notes, fruit and floral aromas (orange, honey, grapefruit) and some hints of coriander. Taste – Citrus notes along with some of that Belgian yeast character. A bit of a bitterness to it on the finish. Those floral notes come across more as a herbal taste. There is a slightly metallic finish on this as well. Mouth feel – Belgian yeast and some pepper with a slightly bitter, metallic, dry finish. Overall – Overall this brings mostly what I’d expect from a saison. Good Belgian yeast notes along with some citrus and herbal notes. Coriander is there along with a slightly bitter dry finish. The odd metallic taste is slight off putting. Do I like it? – I did like. Overall I found it to be pleasant and enjoyable.